Gift Cards are the ideal gifts, for special days, festivals or for no occasion at all. It gives the receiver more choice and saves on time and effort for the giver. This season choose the favorite Shoppers Stop Gift Card for your near and dear ones and let them choose from a variety of leading national and international brands that it houses. 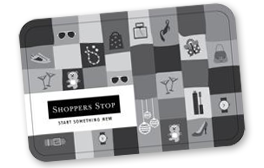 Shoppers Stop offers the best in clothing, shoes, jewelry, perfumes, gadgets, watches, dinner sets, home décor and much more. It is truly a shopper’s stop for everyone and men, women and children can all shop here. Men can choose their polos from international brands like Benneton, US polo, women can pick up the best ethnic wear from Biba or formal wear from Ginger or Vero Moda and then there is Mothercare for children – there is literally something for everyone and you can get the best deals on all special occasions. Giftbig.com let’s you choose from a range of gift ideas from a multitude of brands to keep all your loved ones happy. Log on to giftbig.com, select a Gift Card, choose and amount and enjoy the joys of giving. 1. This Gift Card is not valid on mobile phones, mobile phone accessories, cameras, mp3 players and laptops. 2. This Gift Cards i not valid on 22k and 24k gold jewellery and gold coins of any jewellery brand. 3. This Gift Card cannot be exchanged for cash as well as smaller Gift Card denominations. 4. Only a credit note shall be issued for part utilization of the Gift Card. 5. Conditions apply- in case of promotions & events subject to Mumbai jurisdiction. 6. Only valid cards at the sole discretion of shoppers stop shall be accepted for redemption. 7. If Gift Card is lost, misplaced or stolen- no duplicate Gift cards shall be issued. 8. Gift Cards are not accepted at the food café. 9. Valid at all outlets of Shoppers Stop, Shoppers Stop airport stores, Home Stop & Mothercare (only at company owned stores of Mothercare) for 12 months from date of issue.